You gonna get yourself aligned with your own mind, you gonna get it free. Originating from Lafayette, Louisiana, Givers are an indie rock band with afro-beat influences. The group consists of Tiffany Lamson (vocals, percussion), Taylor Guarisco (drums), Kirby Campbell (drums, samples, keyboards), Josh LeBlanc (guitar, bass) and Nick Stephan (Saxophone, keyboard, flute). Givers originally met in high school and college, working their chops playing the local music circuit with bands like Grammy nominated Cajun roots group Feufollett and Grammy winning zydeco artist Terrance Simien & The Zydeco Experience. 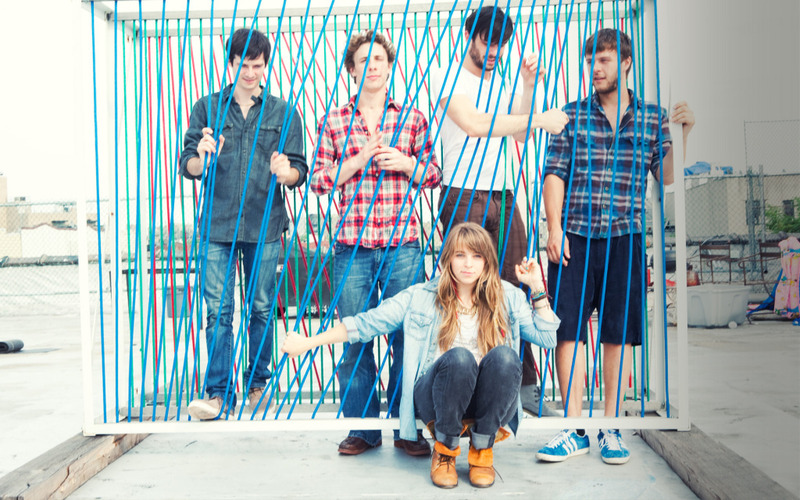 In February 2011, Givers were signed to Glassnote Records and one month later they were named as one of Time Magazine’s “Ten Acts That Rocked South by Southwest.” Their first full-length album In Light was released in June 2011, and was produced by Ben Allen (producer of Deerhunter and Animal Collective). In the early 19th Century, the Creole people of Louisiana created a new form of music called Zydeco (meaning “times are hard.”) Rural and fast tempo, it was the type of music meant for large social gatherings. Two centuries later, indie rockers GIVERS are preserving the musical traditions of their native Louisiana on their debut album In Light. Integrating Afro-Caribbean styles with indie rock and dance, GIVERS create the type of feel-good music that's perfect for summer parties. Produced by Ben Allen, who has also worked with bands like Deerhunter, Cee-Lo, and Animal Collective, In Light is full of brilliantly-catchy tracks from start to finish. Opening track “Up Up Up” sets the mood for the album, and not just with its cheerful title. Layers of hand claps are dotted between floating xylophone, synth, and flute lines. Singers Taylor Guarisco and Tiffany Lamson alternate between male/female harmonizations and call-and-response techniques; and the effect is nothing short of euphoric tribal music. Cascading rhythmic waves and shimmering guitar build-ups gives “Meantime” a slightly tropical feel. Lamson's scratchy vocals call out, “And all this time you've lost, you learn again!” before a bubbly percussion solo, and suddenly you can't help but imagine hanging out on a balmy Caribbean beach. And while GIVERS warn, “don't get stuck in the meantime/no such thing as the meantime,” the phrase itself will be stuck in your head long after the song is over. “Saw You First” starts out with a rootsier, Americana feel in the way the acoustic guitar-picking comes rollicking along. Bleepy, laser-like synth noises come through next, giving the song the feel of a futuristic journey through the bayou. While the majority of In Light is about conveying positive vibes through tribal-like music styles, there are moments in songs like “Atlantic” and “Go Out At Night” that are stripped down and more reflective. And though these songs may not have the immediacy of “Up Up Up” or “Meantime”, they maintain GIVERS' signature percussion-driven feel, layered with rich instrumentation and harmonies. This is definitely a go-to album to have on hand, for summer parties or when you're just craving a solidly great album—period.